Are you aware of what your unique selling proposition is? It’s important because you need to have the ability to communicate this to grab the prospect’s attention as well as stand out amongst competition. “What is in it for me?” is one of the main things your prospect wants to know or is concerned with. By just talking about your products and what they do, you’re not answering this question. To a certain degree, we’re all self-serving. We care about what we have to gain as well as how we can improve. When applying that to your prospects, they’re usually concerned and/or interested in how they can increase their profit, save more time, increase their fun, etc. When designed correctly, your unique selling proposition should address this as well as communicate how the prospect can benefit by working with you. Try identifying the value you have to offer your clients which is one way to get started with this. How you help your clients and/or what they can improve and achieve by using your products or services is value. 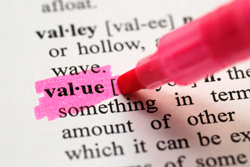 This concept of value can be broken down into three levels – technical, business, and personal. How you help a prospect at the lowest level in the areas of systems, processes, and people is technical value. An example of delivering technical value is helping a client improve a process. Once your clients have the ability to realize technical value, this will usually work its way up and create business value. Areas like revenue, costs, or delivery of services are where business value can be seen. It helps save time and decrease costs when you help a client improve a process which is an example of realizing business value. It continues from there because the technical value and business value will usually create some sort of personal value. They are improvements which can be seen in the areas of improved compensation, career growth, and/or work environment. If you help an executive to decrease costs, it could improve an executive’s bonus at the end of the year and this is personal value. Once you understand the value that you offer, you should be able to arrive at some different versions of your value proposition. If these differ and are unique, they could be used as your unique selling proposition. You might want to go one step further and look at your differentiation if you get to that point and your value propositions are fairly similar to what your competitors do or say. How are you different from your competitors? What do you do differently from them? You can look at what the differentiation means to the prospect or client when you identify that. What value will be conveyed to them by this differentiation? This can be broken down to the three levels of value which are technical, business, and personal. SalesScripter provides call script tool that helps sales pros to build their unique selling proposition.